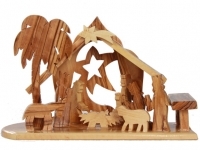 HolyLand-Gifts.com brings a wide and exclusive range of Christmas Nativity Set options made from olive wood. The nativity set indicates to the birth place, conditions and circumstances in which Jesus Christ was born to a virgin Mother. The Nativity of Jesus, also known as, The Nativity, refers to the accounts of the birth of Jesus. Whether you want something special to garnish your fireplace mantel or something special to offer near and dear ones on the favorable occasion of Christmas, we have crafted and designed Christmas Nativity Sets that are flawless and full of peace. One of the most remarkable facts that make the Nativity set first choice of all is that they are naturally beautiful, exquisite and full of charm. Elegantly crafted by Bethlehem Christian artisans, who make these Nativities with fine quality materials. Check our website to have a new meaningful Nativity scene for your home or office. Enjoy a Nativity set this Christmas that not only takes your connection to Christ to the next level, but also makes a specific place look more enchanting and extraordinary.